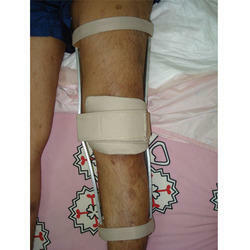 Manufacturer of a wide range of products which include push knee splint and knee cage. Push Knee splint is given in case of spastic quadriceps where patient has a knee flexion tendency. This helps to prevent from knee contractual. These are custom made for snug fitting. Here uprights are light weight & have soft foam & Velvet padding. Has ultra soft foam with fabric covered knee cap to pressurize the knee to straighten. Knee Cage is the customized knee brace which can be given for the conditions like mild to moderate Valgus / Varus deformity and / or Genu Recurvatum. 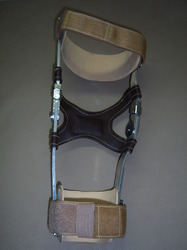 When off-the-shell brace are not fitting properly to the patient due to its unusual shape, customized brace is the only option. Joint can be Aluminum or Mild Steel depending upon the patients profile.